This Sunday is the day for the biggest sporting event in Turkey! 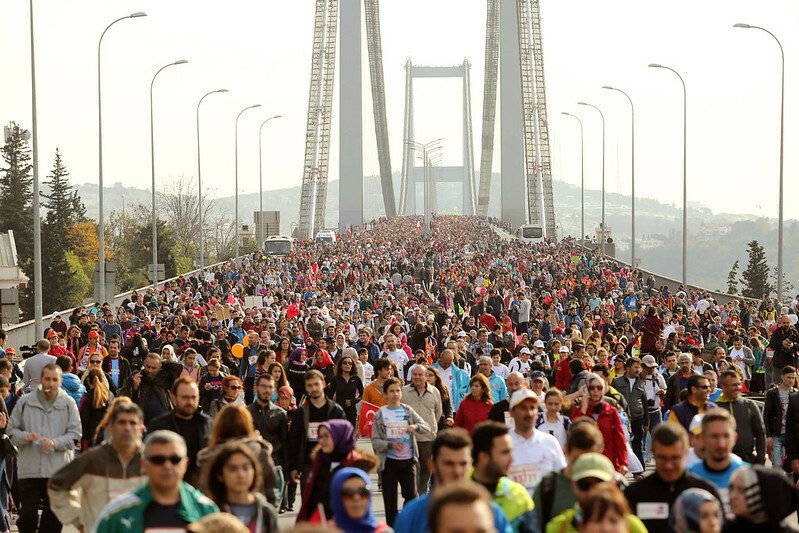 You guessed it right, it’s the Vodafone Istanbul Marathon. 2014 will be the 36th year for the only intercontinental road race that ever happens. To emphasize how big this event is, I have to note that it is in the “Gold Label” category of IAAF, a label which only 39 races throughout the world hold. This year, as we’re interested in Social Network Analysis, we’re “running” this marathon in some other ways*. We’re tracking you! We’re tracking Twitter, to put it better. We actually started doing that on Wednesday night, the night before the marathon expo starts. So far, we can hardly stop ourselves from what you guys have been tweeting. Keep posting, we’re on it! We’re expecting more tweets on Sunday. We assume every single one of you on the bridge would like to share the feeling, right? Do it! So what will we do with the data we collect? We’ll count your tweets. We’ll give your tweets to SentiStrength to see your emotions. We’ll see whether number of happy participants will exceed the number of angry drivers this year. We’ll see which city tweets most about the event (um.. Istanbul?) We’ll also take a deep look into the geolocations. We’ll try to see the race course from your tweets. We’re pretty excited on the topic, and we are curious to see the results. I’ll be sharing the results next week, on the very same blog. We’re also running the marathon in the usual way. I, personally, am going for the 15k. I also try to do a fundraising through the marathon, for the Buğday Association, an organization for supporting ecological living. You can see my campaign right here.